"The mad scientists of pop, mixing unlikely solutions from incompatible artists and distilling entire genres, the tenacity of a Rottweiler and the charm of a Disney prince"
Frisky & Mannish are pioneers of popmusicy-seriocomic-mashparodic – LOUD – vaudevillian- sketchcabaret- throwbackcurrent-oldfangled-newfashioned-babspotty-infotainment! 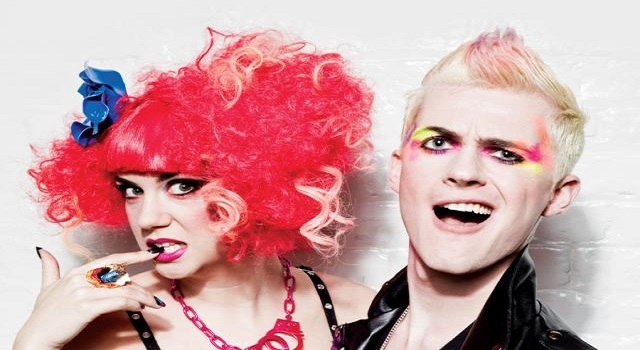 A British musical comedy cabaret double act, formed in London in March 2008 by Laura Corcoran (vocalist) and Matthew Floyd Jones (pianist and vocalist). Well known for a style of parody that consists of "shrewdly crafted, expertly delivered and rapturously received observations on pop music. Corcoran and Jones portray themselves as "pop educators." "the mad scientists of pop, mixing unlikely solutions from incompatible artists and distilling entire genres into their separate elements" with "the tenacity of a Rottweiler and the charm of a Disney prince."